Our feverish eating slowed about half way through the grilled goodness. One brave pigeon came dangerously close to stealing our sandwich as he tried to sneak his way around our liter of beer (it's a liter or nothing in those parts.) Our bellies were full but we weren't about to leave any part of our sandwich for the hungry scavenger. 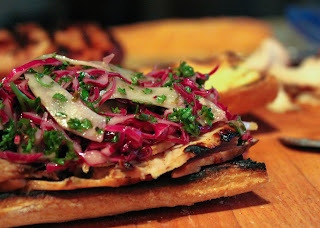 This grilled turkey and fennel cabbage slaw sandwich was created as a reminder of that gorgeous day. I didn't make dozens of toppings or sauces but I did create a coleslaw topping using a chimichurri-like base. And let me be clear on this point- not once in Argentina did I see turkey or chicken or anything less than red beef; but after two weeks of red meat my body was craving something from the bird species. Th moral of this story is you can't go wrong with grilled meats and never be afraid of local fare. Always go to the cart with the biggest line, especially if there are Policia in that line, for the best Fat and Happy experience. Fat and Happy Food Blog Tips and Techniques: Make the slaw earlier in the day so the flavors have time to meld. Brush the bread with a spicy olive oil before grilling it for a little extra bite. Grill the turkey to desired doneness. Two key factors when grilling meat: rest your meat twice. First when you take the meat out of the refrigerator; allow the meat to sit at room temperature for about 20 minutes before placing it on the hot grill. Then rest the meat after taking it off the grill for at least 10 minutes to allow the juices to redistribute. Much of the precious juice will run out if you cut into it too soon. Slice the turkey relatively thin once it has rested. Slice open the bread, brush the sliced area with olive oil and then place on the grill (cut side down) until the bread is lightly toasted. 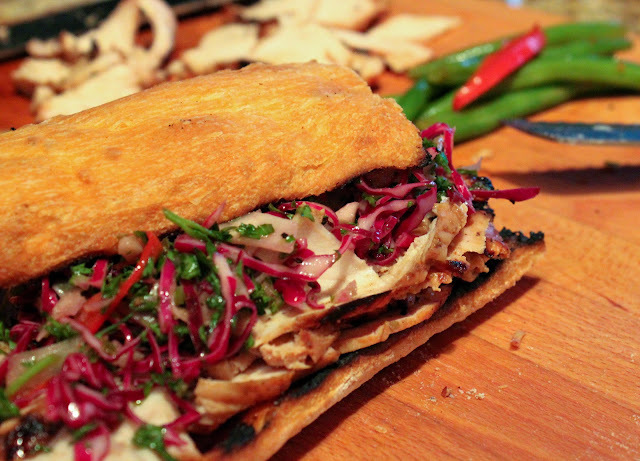 Place a layer of turkey on the bottom half of the bread, then add a heaping scoop of the fennel cabbage slaw on top. Add the top bun and enjoy! Toss all the ingredients together well. Allow the slaw to rest for a few hours for the best flavor. Pile on top of the sandwich as directed above or serve as a side.